On An Overgrown Path: Where have all the Requiems gone? Where have all the Requiems gone? While I was away in November Jessica Duchen lamented the lack of post-9/11 Requiems in an article for the Independent. John Tavener's Requiem did not make the cut for Jessica's piece but instead gets the consolation prize of a post here. Commissioned for Liverpool's 2008 tenure as European City of Culture, Tavener's Requiem is a truly syncretic work. It uses texts from sources including the Catholic Mass, the Qur'an, Sufi poetry and the Hindu epics to extol the gnostic viewpoint that, to quote the composer, although "the different religious traditions are often in conflict with each other... inwardly every religion is the doctrine of the self and its earthly manifestations". The final movement Ananda, which is a pulsating arch built around the words "I am that - I am God" sung in Sanskrit, Hebrew, Greek and Arabic, is a thing of both great beauty and truth. 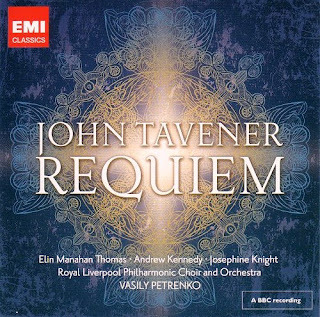 EMI's release of John Tavener's Requiem was one of the more memorable achievements of a label in its death throes, despite the above the composer billing for EMI's now departed vice president A & R on the company's website. 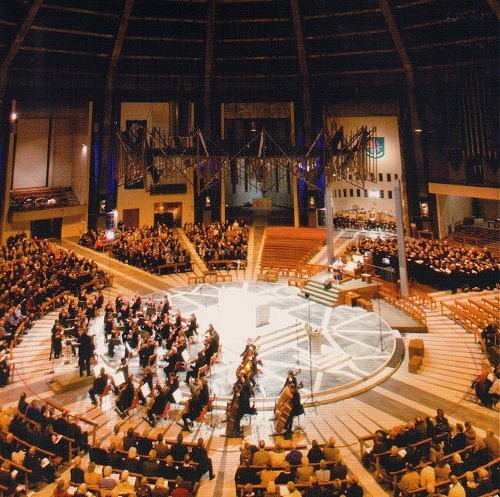 The excellent sound quality of the CD, which is mastered from Radio 3's recording of the Requiem's premiere given in the acoustically challenging Liverpool Metropolitan Cathedral - see above, is a useful reminder that the BBC can still do good things when Petroc Trelawny is not around. Current Amazon price is £6.99 for the 63 minute CD, need I say more? More on John Tavener and Gnosticism here, and, although, not a post 9/11 work I cannot pass up the opportunity to also advocate Rudolf Mauesberger's Dresden Requiem. * No commercial recording is available of John Tavener's setting of the 99 Names for Allah from the Qu’ran The Beautiful Names, and I am told there are no plans to issue one. BBC Radio 3 broadcast the premiere from Westminster Abbey so a high quality recording exists. Surely an enterprising record company (are there any left?) can license the BBC master just as EMI did with his Requiem? It would make a welcome change from yet another Mahler symphony. One of Cherubini's many distinctions is that of being the only serial requiem-writer. Or am I missing someone? There was a wonderful EMI box containing all of them. You have reminded me of how much I have enjoyed Carus' new release of the Cherubini Requiem in C which uses the chamber sized forces of the Kammerchor Stuttgart and the Hofkapelle Stuttgart. I must devote a post to it. Beethoven said: "If I were to write a Requiem, Cherubini's would be my only model." Maybe modern composers should take heed. But I have a feeling there were only 2. Still, no one else wrote a pair.